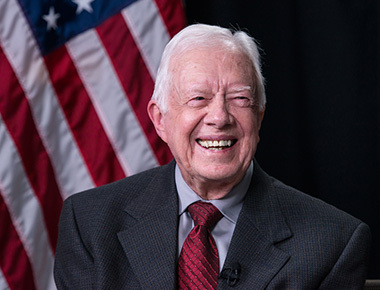 Learn more about former U.S. President Jimmy Carter’s work at The Carter Center. The Center advances human rights and alleviates unnecessary human suffering in over 80 countries. At work in many of the poorest regions in the world, The Carter Center brings hope to those who need it most. Watch a short video timeline of Jimmy Carter’s path from a young farm boy in Plains, Georgia, to a negotiator of peace as President of the United States. In honor of the President Carter’s 90th birthday, friends, family, and volunteers from Trees Atlanta and the De Roode Lab at Emory University gathered at The Carter Center for a formal dedication of the Jimmy and Rosalynn Carter Pollinator Garden. Enjoy this Smilebox guided tour of Plains, Georgia, made by two kids!